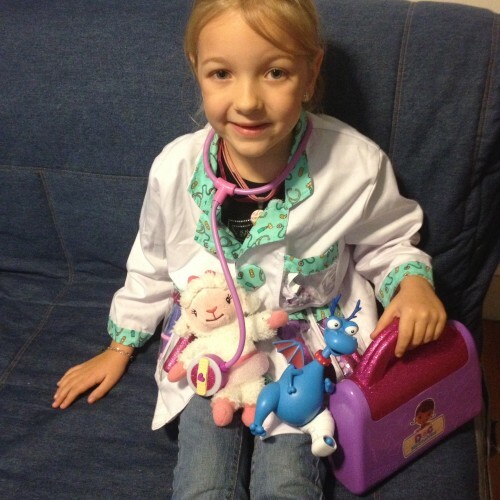 Doc McStuffins is a staple cartoon in our home. 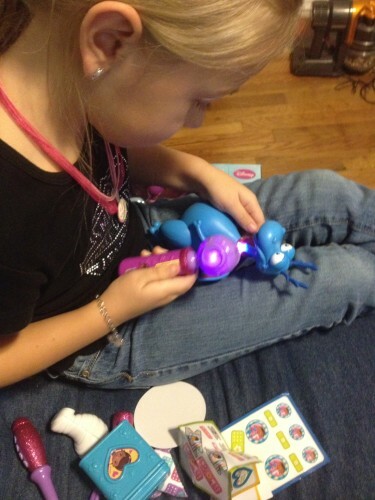 Both kids love to watch Doc take care of her toys when they get hurt or break. When the show first came out Eva was super excited about it and she pretended to be Doc all the time. She wanted to have the toys that Doc had but there weren’t any available at that time. 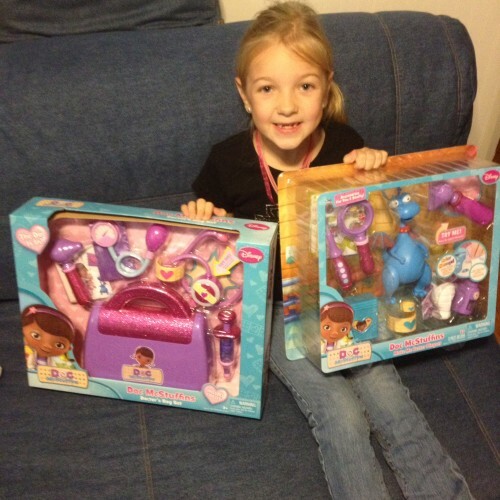 This holiday season their are quite a few Doc McStuffins toys available from Just Play. We received the Doctor’s Bag Set and the Make Me Better Playset. Eva loved both of them and quickly put them to use. 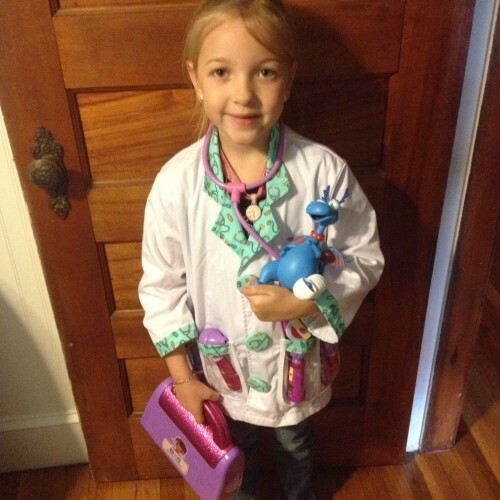 Eva likes to dress up and pretend so we got her a doctor’s coat so she could pretend to be Doc McStuffins. She’d put on her coat and line up all of her toys and begin to give them checkups. We got her some doctor’s tools to use but she really wanted to be just like Doc. The two toy sets that we received to review had a bunch of doctor’s instruments and also a bag to keep them in. The Make Me Better Playset contains a Stuffy Figure, Light and Sound Play Otoscope, Color Change cast, Cloth, Bandage Cuff for Kid and Stuffy, Play Bottle, Bandage Box, 3 Bandage Sticker Sheets, Play Thermometer and Magnifying Glass. The Doctor’s Bag Set contains Doc’s Bag, Syringe, Blood Pressure Cuff with working gauge, Otoscope, Bandage Cuff, Sticker Sheet, and of course, Doc’s Magical Stethoscope with Light & Sound. With both of those sets Eva had everything she needed to care for her toys as Doc. She was very excited about these new tools and couldn’t wait to examine Stuff and also her very own Lambie doll. These toys are very nice and offer kids a fun way to not only play like their cartoon friend but to use their imagination. The sounds are right from the show and it was adorable watching Eva play with Doc’s magical stethoscope. She was checking on everything that could be wrong with Stuffy and being so kind and gentle with him. She has such a rich imagination and a caring heart. When a toy can help facilitate that sort of play I’m all for it.